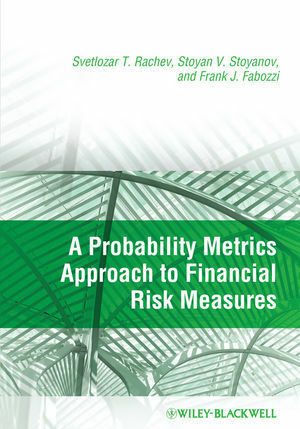 A Probability Metrics Approach to Financial Risk Measures relates the field of probability metrics and risk measures to one another and applies them to finance for the first time. Helps to answer the question: which risk measure is best for a given problem? Svetlozar (Zari) T. Rachev is Chair-Professor in Statistics, Econometrics and Mathematical Finance at the University of Karlsruhe in the School of Economics and Business Engineering. He is also Professor Emeritus at the University of California, Santa Barbara in the Department of Statistics and Applied Probability. He has published seven monographs, eight handbooks and special-edited volumes, and over 300 research articles. His recently coauthored books published by Wiley in mathematical finance and financial econometrics include Fat-Tailed and Skewed Asset Return Distributions: Implications for Risk Management, Portfolio selection, and Option Pricing (2005), Operational Risk: A Guide to Basel II Capital Requirements, Models, and Analysis (2007), Financial Econometrics: From Basics to Advanced Modeling Techniques (2007), and Bayesian Methods in Finance (2008). He is cofounder of Bravo Group, now FinAnalytica, specializing in financial risk-management software, for which he serves as Chief Scientist. Stoyan V. Stoyanov, Ph.D. is the Head of Quantitative Research at FinAnalytica specializing in financial risk management software. He is author and co-author of numerous papers some of which have recently appeared in Economics Letters, Journal of Banking and Finance, Applied Mathematical Finance, Applied Financial Economics, and International Journal of Theoretical and Applied Finance. He is a coauthor of the mathematical finance book Advanced Stochastic Models, Risk Assessment and Portfolio Optimization: the Ideal Risk, Uncertainty and Performance Measures (2008) published by Wiley. Dr. Stoyanov has years of experience in applying optimal portfolio theory and market risk estimation methods when solving practical problems of clients of FinAnalytica. Frank J. Fabozzi is Professor in the Practice of Finance in the School of Management at Yale University. Prior to joining the Yale faculty, he was a Visiting Professor of Finance in the Sloan School at MIT. Professor Fabozzi is a Fellow of the International Center for Finance at Yale University and on the Advisory Council for the Department of Operations Research and Financial Engineering at Princeton University. He is the editor of the Journal of Portfolio Management. His recently coauthored books published by Wiley in mathematical finance and financial econometrics include The Mathematics of Financial Modeling and Investment Management (2004), Financial Modeling of the Equity Market: From CAPM to Cointegration (2006), Robust Portfolio Optimization and Management (2007), Financial Econometrics: From Basics to Advanced Modeling Techniques (2007), and Bayesian Methods in Finance (2008).